Our four year old class is open to students who turn four years old on or before December 1st of that school year. Montgomery Nursery School firmly believes that each child is a unique individual. We are sensitive to each child’s social, emotional, intellectual, and physical needs. We emphasize Kindergarten readiness by developing both a positive self-esteem and early literacy skills necessary for future tasks such as reading, writing, and mathematics. 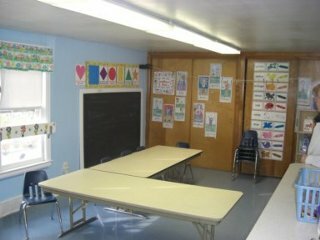 Montgomery Nursery School’s curriculum is based on New York State curriculum guidelines and our staff maintains a close working relationship with district Kindergarten teachers. Daily routine, personal and classroom responsibilities are emphasized and encouraged. Our curriculum goals are accomplished through a variety of mediums such as music, exercise, arts & crafts, computers, and field trips. Parent – Teacher conferences are held mid-year along with an individual evaluation “report card”. Graduation ceremonies are held in June. UPK is a program governed and sponsored by the Valley Central School District (VCSD). This is Montgomery Nursery School’s fourth year as a collaborative agency for VCSD. Please visit http://vcsd.k12.ny.us for further information on VCSD UPK program. Our four-year-old half day class meets five times a week for 2 ½ hours each session. As a collaborative agency of VCSD, any child selected for this program and placed at our school can be placed in either morning or afternoon sessions.